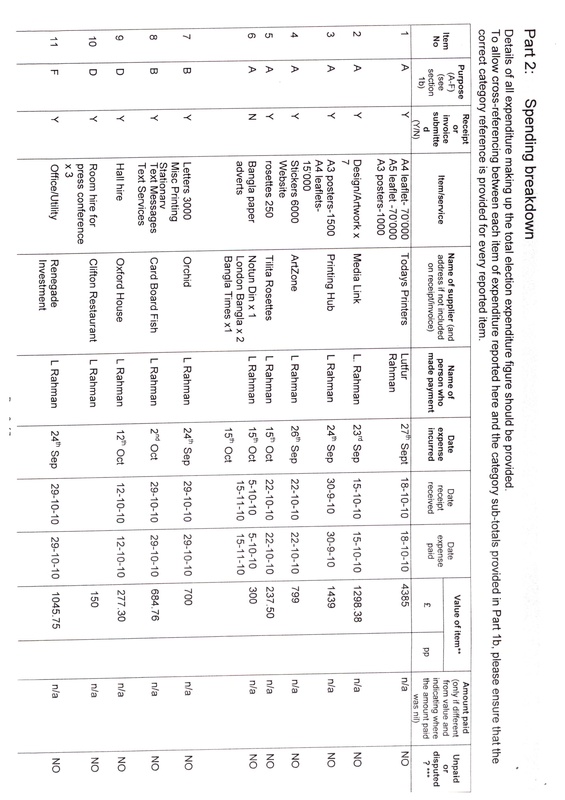 I’ve been sent a copy of Lutfur Rahman’s election expenses, which are publicly available from Tower Hamlets council for a cost of just a few quid. However, the dutiful public servant that I am, and in the spirit WikiLeaks, I thought it would be useful to simply publish them here. I won’t go into detail about every single penny of his £11,316.69 spend, but instead allow you, dear “army of armchair auditors”, to undertake your own exercises in scrutiny. To help, this link outlines what details limited companies must include on their invoices. And the full document can be found here. Informed comments only, please. Any baseless accusations will not be allowed. And, in the interests of fairness and balance, if anyone has the expenses for the other candidates, do please email them to me.